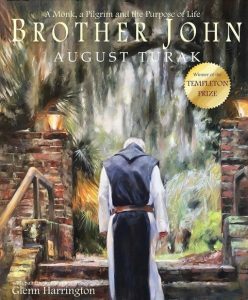 August Turak is the author of Brother John: A Monk, a Pilgrim, and the Purpose of Life (October 21, 2018; Clovercroft Publishing), recipient of the prestigious Templeton Prize. Turak is an award-winning author, speaker, consultant and contributor for Forbes and the BBC. He is also the founder of the spiritual and educational nonprofit the Self Knowledge Symposium Foundation (SKSF). August retired as a successful entrepreneur and corporate executive. He attributes much of his success to living and working alongside the Trappist monks of Mepkin Abbey since 1996. As a frequent monastic guest, he learned firsthand from the monks as they grew an incredibly successful portfolio of businesses. His book, Business Secrets of the Trappist Monks, was published in 2013 by Columbia Business School Publishing. When he is not praying and working alongside the Trappist monks of Mepkin Abbey, he works with his nonprofit and lives on a seventy-five-acre farm near Raleigh, North Carolina. For more information, please visit https://augustturak.com and follow him on Twitter. Why did you write Brother John: A Monk, a Pilgrim, and the Purpose of Life? In 2004 a former student urged me to enter the Power of Purpose Essay Contest sponsored by the John Templeton Foundation. Even though I had never written anything before for publication, I decided to give it a try. Much to my sheer amazement, my essay, Brother John, edged out 10,000 submissions from 47 countries to win the $100,000 grand prize. This launched my career as a writer. 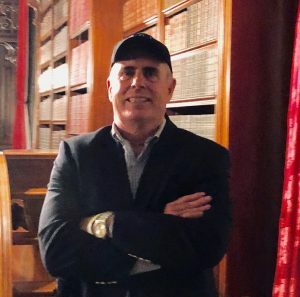 I am now a contributor for Forbes.com and I published Business Secrets of the Trappist Monks from Columbia University Press. Over the years I continued to get a small but steady stream of letters and email from people who had stumbled onto my essay and been moved by it. In turn I found their gratitude incredibly moving. Then in the summer of 2017 an executive drove 8 hours to my house just to thank me for writing Brother John. He told me that Brother John had been instrumental in helping him get over a devastating divorce. This seemed like yet another hint from God that I had to figure out a way to resurrect my essay from obscurity and get it out to more people where it might do some good. Since it was too short to be published as a stand-alone book, I hit on the idea of making it into an illustrated book. Then, through a process too convoluted to repeat, I managed to find Glenn Harrington, an award winning artist, to do the illustrations. Brother John: A Monk, a Pilgrim, and the Purpose of Lifeis the result of our collaboration. Your book is about finding a purposeful life. How can we find purpose if we feel like we are stuck in a job we don’t like or have daily responsibilities that are tiresome? The action of my story revolves around an incident that many would find almost too trivial to notice. On a dark, cold and rainy Christmas Eve, Brother John, rather than attend a party decides instead to stand outside under an umbrella. When I ask him what he is doing he says, “I am here to walk those who forgot their umbrellas back to their rooms.” Sounds like a pretty tiresome way to spend Christmas doesn’t it? But I have been able to turn that single tiresome incident into an incredibly meaningful second career as an artist. I have been able to convince many others that in that single tiresome incident lies the secret to a meaningful life for us all. 3. You won the Templeton Prize for your Brother John essay which was turned into this illustrated book. Tell us about that. What was it like to find out that you’ve won the contest? Well, I addressed most of this question above. However, winning was actually quite humorous. Six months after submitting my essay I got a phone call. Next thing I knew several people, all at once as I recall, were shouting over a speaker phone that I had won the contest. I reacted in utter disbelief. I was certain I was the victim of a practical joke by some friends. Soon the entire conversation degenerated into a round robin of the people on the phone screaming “Yes!” as I screamed “No!” until they finally convinced me. It was without a doubt the closest thing to being struck by the proverbial bolt from the blue that I have ever experienced. 4. You have lived and worked alongside the Trappist monks of Mepkin Abbey since 1996. What was a typical day like for you? Part of the magic of the unchanging Trappist lifestyle is that that every day is typical. We rise at 3:00 AM for the first service of Vigils at 3:20. After Vigils comes meditation only to be interrupted by additional services followed by more contemplation. After breakfast and Mass comes the service of Terce and after that we all head off to work. I used to work in the egg house packing eggs from the Abby’s chickens, so they could be shipped off to grocery stores. But since the monks got out of eggs and into mushrooms I am usually tapped for janitorial services like mopping the church or cleaning the monastic offices. At 12:00 we stop working and go to noonday prayer followed by lunch. All meals are eaten in silence. Lunch is the main meal of the day, and as we eat one of the monks reads from a book chosen by the abbot. After lunch we have another prayer service followed by a short rest period before heading back to work. A light supper is served at 5:00 followed by the services Vespers at 6:00 and Compline at 7:35. By 8:00 we are all in bed ready for the alarm to go off once again at 3:00 AM! An interesting point, in reference to a previous question, when I am at Mepkin Abbey I am always assigned work that most people would describe as “mindless,” “trivial,” and “meaningless.” Yet I consider it a privilege to be allowed to swing a mop all day long. Working alongside the monks is among the most meaningful work I have ever done. What are some of the things you hope readers take away from your book? I want people to realize that we are not in this alone. That life does have meaning and purpose, and that every life counts. Most of all I want them to find the healing power that so many have told me they have experienced from reading Brother John. Where can our readers find more information about your book?